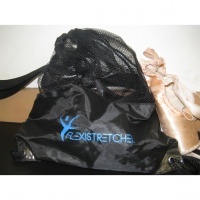 Originally designed for professional dancers to enhance proper stretching techniques and increase flexibility, the Flexistretcher is now used all over the world by gymnasts, cheerleaders, martial artists, yoga and Pilates enthusiasts, and regular people just looking to increase their flexibility. This DVD contains an intense core-focused exercise class using your Flexistretcher. Fusing the fundamentals of Pilates with the proprietary graduated elastic resistance of the Flexistretcher, this class is guaranteed to challenge your core in new ways. The Flexistretcher simultaneously challenges and supports while adding intensity to sculpt and tone your abs. This class is appropriate for all fitness levels.